crowdSPRING is fortunate to have an amazing community of creatives. They number in the thousands, come from more than 125 countries [as of July 2010 – more than 175 countries], speak hundreds of languages, cover all age groups, demographics, experience, religions, etc. They’ve created graphics designs for companies in virtually every country of the world and in most languages spoken on Earth. Our community has previously collaborated on two guides. The first guide was written to help buyers understand what to look for when having a logo designed. The second offered ten tips for buyers to effectively manage design projects. 1. Maintain Integrity and Respect At All Times. When you are on crowdSPRING, you’re part of a global community of creatives. The crowdSPRING community works tirelessly to maintain an air of professionalism and mutual respect. You can help by demonstrating respect – at all times – for other creatives, for buyers/clients, and for other people who visit crowdSPRING. Worry about what you say more than what others say about you. Using foul language or displaying a ‘bad’ attitude is a sure way of turning buyers off and ruining your reputation on crowdSPRING. As flat and mundane as words and sentences can sound, what you write – whether publicly or privately – can greatly affect how you’re perceived by other members of the community and buyer(s).Remember also that how you act and what you say, privately and publicly, reflects not only on you, but also impacts the entire community. Keep in mind that lots of buyers read the forums, too! Protect your reputation and maintain your integrity at all times. It’s important for everyone to remember that the crowdSPRING community is made up of individuals with different skills, software and hardware tools, experience, language proficiency and drive. You may find on crowdSPRING creatives who are just starting out in their careers, working side-by-side in projects with creatives who have decades of experience in graphic design. But don’t mistake perceived lack of experience with lack of professionalism – “professionalism” is earned. If you have a problem with someone else’s work or comments, please send them a PM and/or send crowdSPRING a note using the “contact us” link in the footer of any page. The crowdSPRING community does not tolerate bad behavior. If you want people to treat you as a professional – act like a professional. 2. Pay Attention To The Details. The crowdSPRING community has worked hard to help buyers write better project briefs. And while we still find from time to time poorly written project briefs, the overall quality of the project briefs has improved. Particularly in projects where a buyer has taken the time to prepare a detailed project brief, it frustrates buyers when they see entries to projects that do not follow the directions provided by buyers in their briefs. It’s not enough to look at the project Gallery, see the entries from others, and start working on your own concepts. You should always review the buyer’s brief and any updates to that brief (the brief and all updates are listed on the project Details tab) before you start work. Make sure that you understand any special technical requirements. For example, you’ll find in every project Details tab the file types that the buyer expects to receive if your design is selected. You should be able to deliver all file types listed by the buyer. You should also make sure you understand any special requirements for the project. For example, in stationery projects, if the buyer is from the Netherlands or Sweden, there are specific postal and non-postal requirements that you should know: Dutch and Swedish. If the project is for product packaging design, you should make sure you understand the dimensions of the packaging. If the project is for stationery design, make sure you know which pieces of stationery the buyer is interested in receiving. In most projects, the buyers will clearly list the special technical requirements in their project brief. If they have not – please help the buyer and other creatives by asking for this additional information. Finally – make sure you respect the project categories – because that helps keep crowdSPRING a level playing field for all. If you are responding to a logo project, it harms the community if you submit both a logo and stationery designs. Buyers should understand that any requests outside the brief / file requirements etc may be subject to additional fees at the discretion of the creative. If you don’t respect project categories, you undermine the efforts of other creatives and the entire community and ultimately – harm your own opportunities. Age group: What is the buyer’s audience and clientele? An audience ranging from 16-25 will likely have greatly varied tastes in design to those ranging from 40-65+. Culture: Consider companies such as Amazon and Apple. Both companies boast a young, hip, and modern culture both in their employees and in their market messages. Try and emulate the culture that they have already established. For example, don’t propose ultra-conservative logos for young, hip and modern companies. Product or service offerings: This will sound obvious, but you would be surprised what some people come up with, both on the creative side and the not-so-creative side. If a buyer indicates in the brief that they are a technology company, try and find out what they actually DO and what they do best. A logo design featuring a television when they have only operated with televisions a few times probably wouldn’t be the best concept. If you have general questions or comments about a project, don’t keep them private. Follow the lead of three year olds and ask your questions. Posting a public question in the project’s Activity tab helps the entire community, keeps conversation open and makes information exchange quicker. Obviously, this doesn’t mean that all your research needs to be public. Feel free to send buyers a PM to ask a few questions about the project. But remember that buyers receive a lot of PMs from other creatives. Don’t send a generic PM – think about what you NEED to know before you reach out to the buyer and be very specific with your questions. 4. Take Advantage Of The Creative Brief. Although most creatives accompany an entry with a few descriptive words or sentences, don’t forget that you have an opportunity to explain to the buyer why you are proposing a particular concept. Don’t simply say “this is my entry, hope you like it.” Many buyers could use some help to understand why you chose particular fonts, colors, marks, style, etc. This is your opportunity not only to explain your choices, but to show the buyer that you’ve thought about the project and didn’t merely draw a nice picture. This is your chance to show how your work stands out from the crowd. There are many examples of outstanding creative briefs. Your creative brief can be short and sweet, as you can see in a creative brief from shubho_roy. 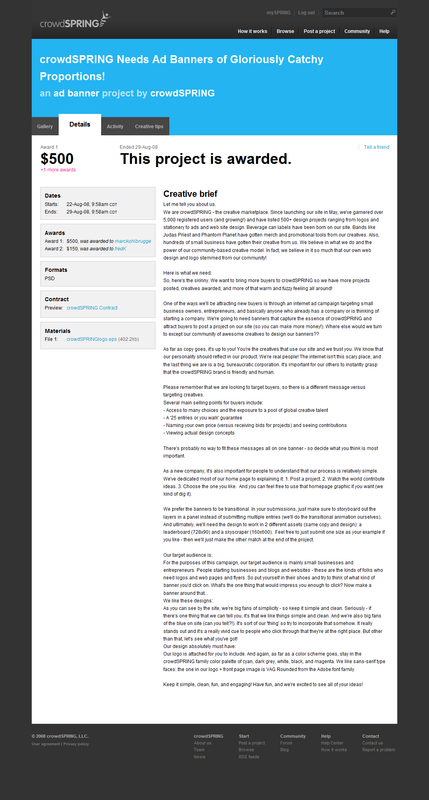 Alternatively, you can provide more detail, as you can see in a creative brief by tercran. And more often than not, if you invest a few minutes into writing a detailed creative brief, you’ll be rewarded with constructive feedback from the buyer. Buyers recognize effort and generally appreciate when someone helps them to understand the thinking behind a particular design. 5. Always Be Truthful About Your Work. Remember that your reputation takes a long time to build, but can quickly collapse. A professional remains a professional at all times. If portions of your work are not your own, disclose this in your creative brief. If you used clip art or stock imagery, make this clear. Remember that this is an active community and if you’ve seen something, chances are pretty good someone else has seen it too. So don’t jeopardize all of your hard work to build your reputation – make full, fair and honest disclosures when submitting entries to projects. It’s a lot easier to to become a better designer than it is to rebuild a reputation. 6. Find Your Personal Work Style. There are many different work styles on crowdSPRING. Some creatives will never look at the project Gallery before submitting their own concepts. They do this for a number of reasons – some don’t want to be influenced by how other people responded to the buyer’s requirements while others don’t want to subconsciously concept copy someone else’s work. Yet other creatives always look at the project Gallery before sitting down to create their own concepts. One approach isn’t better than another. Find an approach that makes sense and works best for you and follow it. If you have the slightest gut feel that your design is similar to somebody else’s design and you haven’t yet submitted your entry, consider not submitting it. One benefit of participating early in projects is the ability to stake out unique concepts that are not directly inspired by the buyer’s creative brief. Respect those creatives who submitted concepts earlier in the project and give them the opportunity to refine their entries in response to the feedback from the buyer. If at any point during the project you believe your entry is similar to that of another designer, and you’ve already submitted your entry, don’t wait for them to contact you. Send them a PM and point out the similarities. Explain that you’ve developed your entry independently but do understand that the entries appear similar. Offer to withdraw your entry (if appropriate). You’ll find that such actions not only reflect how a true professional would approach this issue, but also earns you a great deal of respect from others. Your reputation is important. Protect it at all times. Whether you look at the project Gallery or avoid it, recognize that sometimes, multiple creatives can submit similar or even identical looking designs. That two designs are similar or identical doesn’t mean that one copied another. While it’s rare, it’s possible for designers working separately to come up with identical concepts. When you see that someone has submitted a design similar to yours, always remember the first point – integrity and respect. Don’t assume someone is copying your work. You can send the other creative a polite PM mentioning the similarities and asking that they withdraw their entry. Always include a link to your entry and to theirs, and do your best to explain exactly what you find objectionable about their work. Or you can contact crowdSPRING via the contact us link in the footer of any page and we’ll get involved. DON’T start publicly accusing someone else of “stealing” or “copying” your design. While there are many reasons why this is a bad practice – here is the most important reason: such public accusations reflect poorly on everyone and are not professional. There are many ways to deal with concept copying – public finger-pointing is NOT the proper way. If someone has sent you a PM telling you that they believe you copied their design, always remember the first point – integrity and respect. Don’t react – think twice and respond calmly. If you believe your design is different, explain why. If you believe that the designs are similar, consider withdrawing it. And if you believe that their “claim” has no merit, politely tell them that you disagree. Treat others as you would have them treat you. With respect. 7. Don’t Take Things Personally: Not all buyers provide feedback. When they do, the feedback helps you in multiple ways. It could mean the difference between finding a new client and not being selected in the project. Feedback could also help you to refine your style and approach. Don’t assume that because your entry has not been scored, the buyer didn’t leave feedback. Some buyers do not score entries but leave detailed feedback. Respect goes both ways: If you ask of the buyer to be active in terms of presence, feedback and ratings, you should be prepared to take buyer comments and ratings into account when doing revisions and/or introducing new concepts (as well as dropping a concept altogether). Always remember that when leaving feedback, buyers are not looking to criticize you or your work. Buyers leave feedback to help you understand what they like or don’t like about your work. Do not take personal offense if they buyer says that a color combination, font or graphic is not working for them. It’s no coincidence that the most successful creatives on crowdSPRING listen to all feedback – good and bad – and improve their craft. They don’t take feedback personally, they don’t lash out at buyers, and they don’t bad mouth others. If you find that a buyer isn’t giving you the type of feedback you expect, keep your cool and move on to another project. And if you are just starting out, remember that it takes time to develop skills (both for design and effective communication). You clearly want to excel, but don’t forget to take it one step at a time and to celebrate incremental success. Similarly, don’t expect the buyer to tell you what to do. Don’t get frustrated if the buyer doesn’t seem to be giving ample feedback. It is possible that they know very little about design and even more possible that they don’t know how to talk to creatives. Do your very best to translate what they say into what makes sense from a design point-of-view. If a buyer requests that the letters be closer together, he or she might want a kerning adjustment. Likewise, if the buyer doesn’t like “the things on the ends of the letters,” he or she will probably be referring to the serifs. Adjust accordingly. And don’t forget to check the project’s Activity tab. Sometimes, the buyer will post general comments directed to everyone in the project. If you don’t check the Activity tab, you might miss out on those comments. 8. Be Creative And True To Yourself. No matter what your experience is in the field of graphic design, you have a gut instinct and most likely an eye for design. Do what feels natural when approaching a design for the first time. Some people like to sketch. Others start working on the computer right away. That said, regardless of how you start, be original at all times. Don’t abandon a concept just because you don’t think it will fit the brief. Sometimes, our fear of failure can paralyze us. Overcome that fear.crowdSPRING is about providing the buyer with choice, so do not be afraid to go out on a limb with an entry. Now – there is a difference between ignoring a buyer’s brief and offering the buyer an alternative approach. If you are proposing something that runs directly counter to the buyer’s instructions, address that discrepancy head-on. Explain why you’ve proposed your concept and why you believe it would be right for the buyer. You never know…some creatives have successfully persuaded buyers to go in a different direction with well-executed designs and strong creative briefs. And if you see that the buyer has already scored and entry or two at five stars, don’t be turned off to entering your own concept out of fear that the buyer has already made up their mind. If your entry is compelling and unique, you could change the buyer’s mind – this does happen. Obviously – you should follow your heart – if you think it would be wasteful for you to spend time working on a project that already has multiple five star entries – move on to another project. Always respect the buyer’s wishes. If the buyer expresses a wish to not see further versions of a concept, be it yours or another creative’s, try as hard as you can not to enter similar designs. 9. Don’t flood. There is nothing wrong with submitting multiple entries to a project. But be cautious about this practice and make sure that there is a good reason why you are submitting multiple entries – particularly before you receive feedback from buyers. There is a big difference between responding to a buyer’s feedback asking for different color variations on a design and submitting 10 designs before you get any feedback with different color variations. If you are simply flooding projects, it makes you look unprofessional and reflects poorly on the entire community. And if you see someone submitting multiple concepts, don’t automatically presume that they are “flooding” the project. Everyone has distinct work styles. Some creatives will submit one entry and won’t submit others until they get feedback from the buyer. Other creatives will submit multiple concepts. There is no right or wrong work style. 10. Value the Community. 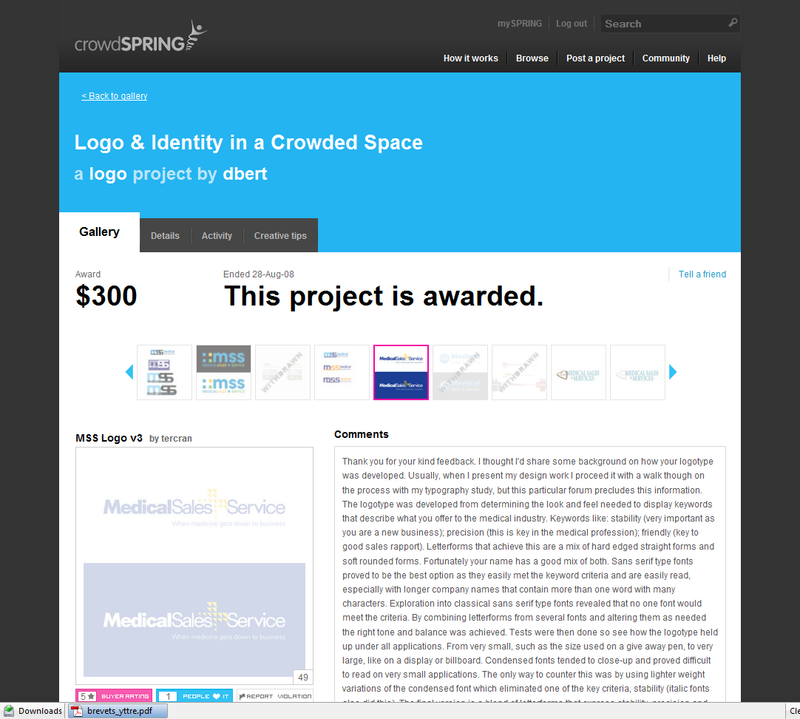 While every project, much like every offline job, is a competition, do remember that crowdSPRING is a community. Even if you do not win a project, that doesn’t mean that you didn’t help out the buyer in some shape or form. Especially in standard projects (and in Pro projects where Galleries are visible to all), your work does influence in some way the work of others – and you are influenced by the work of others. Take a minute to PM a creative congratulating them on a great win or an impressive entry! If you see that someone has misspelled a buyer’s name – send a PM and let them know. If someone reaches out to you with a question, please do your best to answer it. Not only do these types of acts boost morale, you’ll find new friends and earn respect in the process. Plus, you might get some great pointers! Even professionals with decades of experience can continue to learn and improve. Most importantly, remember that simple actions add up and ultimately will make the entire community stronger.